The Florida Highway Patrol is investigating a crash Wednesday afternoon on Highway 29 north of Barrineau Park Road. Preliminary reports indicated that the driver of a northbound SUV left the roadway and struck a tree just after 5 p.m. The driver was reportedly suffering from a diabetes related problem. The Molino Station of Escambia Fire Rescue and Escambia County EMS responded to the call. The next 24 hours looks to be rainy as showers and thunderstorms stream across the area from the Gulf of Mexico thanks to the distant Hurricane Alex as it makes landfall in Mexico. For the latest on Hurricane Alex, see the map at the bottom of the page. Tonight: Showers and possibly a thunderstorm before 7pm, then a chance of showers and thunderstorms after 7pm. Low around 73. Southeast wind around 5 mph becoming calm. Chance of precipitation is 80%. Thursday: A chance of showers and thunderstorms, then showers likely and possibly a thunderstorm after 1pm. Cloudy, with a high near 88. Southeast wind between 5 and 10 mph. Chance of precipitation is 60%. Thursday Night: A 30 percent chance of showers and thunderstorms before 1am. Mostly cloudy, with a low around 71. East wind between 5 and 10 mph. Friday: A 30 percent chance of showers and thunderstorms. Mostly cloudy, with a high near 88. East southeast wind between 5 and 10 mph. Friday Night: A 30 percent chance of showers and thunderstorms. Mostly cloudy, with a low around 74. East southeast wind between 5 and 10 mph. Saturday: A 30 percent chance of showers and thunderstorms. Mostly cloudy, with a high near 89. East southeast wind between 5 and 10 mph. Saturday Night: A 20 percent chance of showers and thunderstorms. Partly cloudy, with a low around 72. Southeast wind around 5 mph. Independence Day: A 30 percent chance of showers and thunderstorms. Mostly cloudy, with a high near 90. Southeast wind between 5 and 15 mph. Sunday Night: A 20 percent chance of showers and thunderstorms. Partly cloudy, with a low around 73. Monday: A 20 percent chance of showers and thunderstorms. Partly cloudy, with a high near 91. 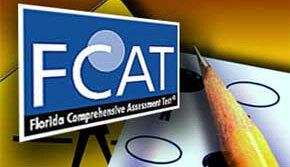 Writing scores increased on the 2010 FCAT for schools in the North Escambia area, while Northview, Tate, Ernest Ward and Ransom recorded some of the highest scores in the county at some levels. The state decreased the grade level baseline score from 3.5 to 3.0 in writing, creating an increase of grade level students at almost every school in Escambia and Santa Rosa counties. The news was not good for Bratt Elementary, with fourth and fifth grade scores falling — sometimes at the double digit level — in reading, math and science. The percentage of students at Northview High School scoring at grade level or above in eleventh grade science was the highest in the county at 58 percent. Northview and Tate tied for second best in the county for the highest high school writing scores and the best ninth grade math scores. Tate had the second highest number of students in the county at grade level in tenth grade math. Ernest Ward and Ransom middle school sixth and seventh graders had the second highest percentage in the county at grade level in math. Ernest Ward’s writing scores were the third best in the county. Scores for each North Escambia area school are below. At the bottom of the page, this story continues with a school by school analysis. Writing scores improved at every grade level taking the test at every school the North Escambia area. Bratt Elementary’s scores decreased in a year by as much as 17 percentage points across the board in reading, math and science. At Byrneville Elementary, there were decreases in fifth grade reading and math, and gain in fourth grade reading. Fourth grade math and fifth grade science scores were consistent from 2009 to 2010. Jim Allen Elementary’s scores decreased from 2009 in fourth and fifth grade reading and fourth grade math. Scores improved in fifth grade math and science. Jay Elementary’s scores decreased in fourth and fifth grade math, and improved or held steady in fourth and fifth grade reading and science. Ernest Ward Middle’s scores decreased in reading and math at all grade levels and increased in eighth grade science. At Ransom Middle, scores over the past year decreased at all grade levels in reading, seventh grade math and eighth grade science. There was a slight increase in the school’s sixth grade math. At the 6-8 grade levels at Jay, there were decreases at all levels in reading and seventh and eighth grade math. Jay’s scores improved in eighth grade science and math. Northview High’s scores over the past year fell in tenth grade reading and math and increased in ninth grade reading and math, and eleventh grade science. At Tate High, scores over the past year fell in ninth grade math and tenth grade reading. Tate’s scores increased in ninth grade reading, tenth grade math and eleventh grade science. At Jay High, there were decreases in ninth grade math and eleventh grade science. Jay’s scores increased or held steady in ninth and tenth grade reading and tenth grade math. The Northwest Escambia 11-12 year old All-Stars beat Niceville 5-1 in six innings Tuesday night at Walnut Hill’s Bradberry Park. Mallory Ryan pitched all six innings for NWE with six strikeouts and no walks. 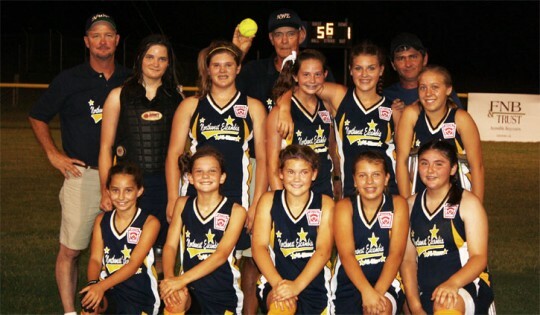 Ryan, Penny Banda, Courtney Peebles, Kristen Byrd and Peighton Dortch each scored one run for Northwest Escambia. With the win, undefeated NWE advances to play again Thursday night at 6:00 against the winner of a 6 p.m. Wednesday game between Niceville and DeFuniak Springs. Submitted photo by Kim Ryan for NorthEscambia.com, click to enlarge. (Updated) Escambia County Sheriff’s deputies have arrested the suspect in a Pensacola armed robbery that they say may also be responsible for crimes in the north end of the county. 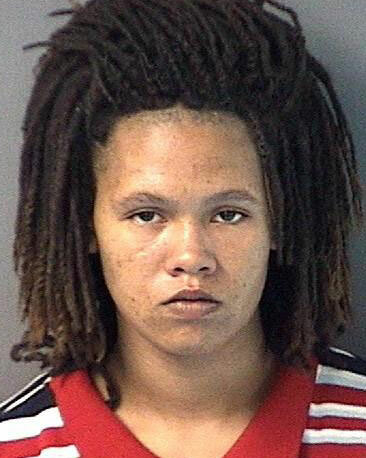 Cheraina Cristle Campbell, 19, is charged with armed robbery with a firearm and public order crimes for wearing a mask or hood during the commission of a felony. She is being held without bond after being arrested late Tuesday night. Campbell charged in connection with a robbery that occurred Monday at approximately 11:20 a.m. at the TQ Mini Mart located at 1112 East Olive Road. During the robbery, deputies said Campbell entered the store wearing a mask and pointing a handgun at the clerk and demanded money. Deputies said she removed her mask as she fled the store and turned to look back at the store allowing the clerk to see the her face. A K-9 unit tracked the Campbell to a nearby abandoned trailer. There was no one inside the trailer, but a photo of Campbell was found inside. The store clerk positively identified Campbell from the photo as the person who robbed the store at gunpoint. “Investigators also believe the same suspect may be responsible for several other robberies in the north end of the county but are not releasing the other businesses involved at this time,” according to a press release from the Escambia County Sheriff’s Office. 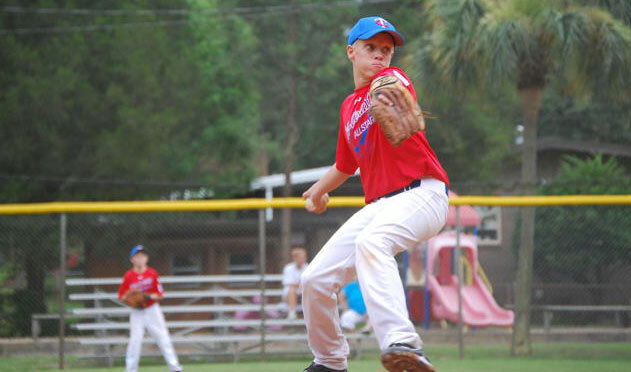 Tri-County beat Destin 16-1 Tuesday night in the Florida District 1 All Star Tournament for 11-12 year old boys baseball. 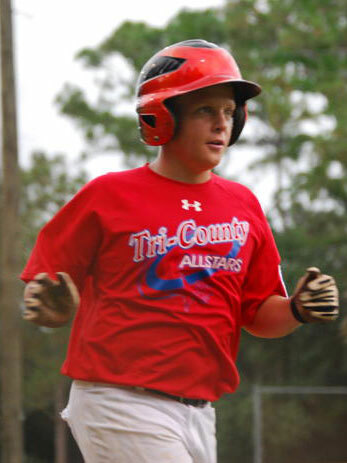 Chase Shell had three big homers for Tri-County, while AJ Nash had one home run. Tri-County, 1-1 in tournament play, will face either Shalimar or Niceville Wednesday at 5:30 p.m.
Pictured top: Action as Tri-County beats Destin Tuesday afternoon. Pictured inset: Chase Shell rounds the bases on his third home run. Submitted photos by Jo Morgan for NorthEscambia.com, click to enlarge. Advanced nursing degrees will be within easier reach for area registered nurses through a new Internet-based partnership between Jefferson Davis Community College and The University of Alabama’s Capstone College of Nursing. Representatives from Jefferson Davis and UA will formalize the agreement during a partnership signing ceremony July 14. Representatives from UA scheduled to attend the ceremony, include Dr. Sara Barger, dean of UA’s Capstone College of Nursing, and Dr. Jeanette VanderMeer, assistant professor in the Capstone College of Nursing and coordinator of the program, known as RN Mobility. Through the use of the Internet, participants can complete the required nursing courses for the BSN degree in one year, without facing the restrictions of being in class on a specific time and day. Instead, RN students have the flexibility of choosing the best time to go online and complete the requirements. Clinical activities are designed on an individual basis, and efforts are made to arrange locations and times convenient to students. UA’s Capstone College of Nursing has established similar partnerships with 16 Associate Degree in Nursing program sites at community colleges and universities and 10 clinical agencies. 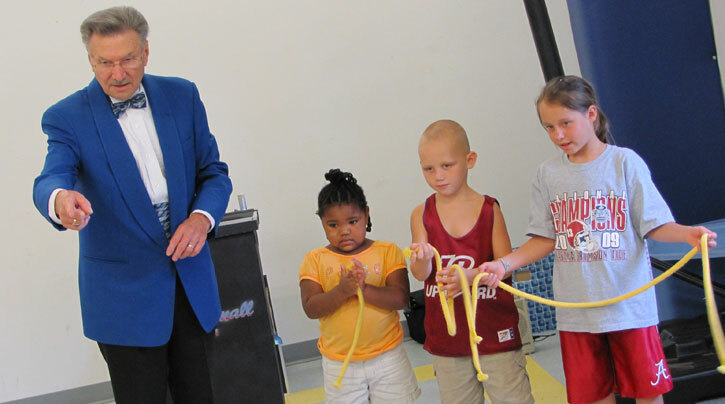 The children at the Camp Fire USA Century Youth Learning Center were recently visited by Beau Broomall with his Magic Moments show. 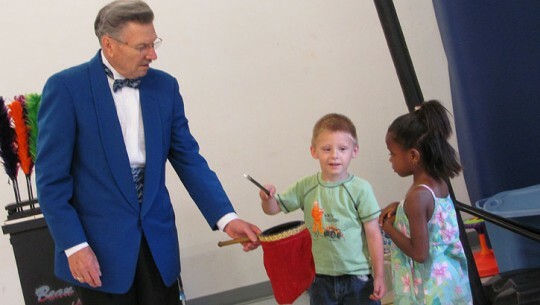 “The children had an exciting time and even participated in the magic show,” said Camp Fire Century Director Pam Townson. Broomall, who started learning magic at the age of 10, has been a professional magician for the past 20 years, performing across the country. Submitted photos for NorthEscambia.com, click to enlarge. Report tar or oiled debris on the beach 1-877-389-8932 or #DEP from a cell phone. DO NOT TOUCH oiled or injured wildlife. Report your finding to 1-866-557-1401. Winds are from the southeast. Thunderstorms are impacting cleanup efforts both on the beaches and in the water. For safety reasons, if lightning is in the area, crews will be unable to continue working. The projected path of Tropical Storm Alex is not expected to directly impact Escambia County. The storm is headed toward northern Mexico and southern Texas. Higher tides and heavier surf conditions may be experienced as a result of the storm. Booms remain deployed and may need to be repositioned if conditions warrant. Pensacola Pass – light mousse and silver sheen was noted in four separate streamers. Three skimmers were on site and helicopter pilot circled to give visual. Coordinates were given to FWC water craft also on site. Streamers were .4 nautical miles, .25 nautical miles, .2 nautical miles, and .15 nautical miles in length. Near the shore of Johnson Beach – observed silver sheen, and light mousse streamers to 2.5 continuous nautical miles east along the Gulf front. Fort Pickens – observed tar balls, mousse and silver sheen; streamers and patches near the shore. Twenty percent coverage of product near the shore from Park West for 3.7 continuous nautical miles east to approximately 1.2 nautical miles east of the Pensacola Beach fishing pier. Observed tar balls, mousse and silver sheen. Five percent coverage of product observed near shore on Gulf side across from sewer plant; approximately 100 foot patch of tar balls, light mousse and silver sheen. No product observed in Little Sabine Bay. Incident Command is reporting 20 skimmers in the inland waterways in Escambia County. Incident Command reported 91,610 pounds of tar ball and oil material was collected by 568 people on Monday. Perdido and Pensacola Passes – Pensacola Pass was reported clear this morning. In Perdido Pass, a patch of reddish-brown mousse, approximately 15 feet by 20 feet, was seen and reported to unified command. The Escambia County Health Department has release information on avoiding oil and tar on the beaches. (More Information). The beaches are open for business. Please be sensitive to the clean up efforts on the beaches. We understand curiosity, but officials are asking the public to avoid work areas and allow room for the workers and equipment needed to clean the beaches. Please do not handle or walk through the tar balls and oil. This only spreads the product and makes cleanup more difficult. Unified Command has released a fact sheet on “If Oil is Spotted on the Shore” that provides details on what happens after the oil reaches the shore. Details. Incident Command has received reports that unknown individuals are attempting to scam people who would like to be beach cleaning workers for the Deepwater Horizon oil spill response effort. Reports have come in from the states of Florida, Alabama and Mississippi. These individuals reportedly state that workers must pay them for training before they can be employed. Legitimate beach cleaning contractors provide all required training free of charge. Individuals approached by anyone offering employment, only after you pay for the training, are encouraged to contact local law enforcement officials. BP claims in Florida total 22,492 with $18,755,093.32 paid. There are 262 vessels are deployed in Florida for the Vessels of Opportunity program. Do not sign any documents in return from money from BP or anyone else until you know the extent of your loss. BP officials carry proper identification badges or business cards. There are reports of a scam involving individuals falsely representing themselves as BP employees and offering applicants training and job placement for a fee. BP does not charge to train applicants. If you or someone you know has been charged for training, please contact law enforcement. BP’s Florida Gulf Response web site: www.floridagulfresponse.com. File claims with BP online: http://www.bp.com/claims. BP’s claims office is located at 3960 W. Navy Boulevard, Suite 16 & 17. The office is currently open 8 a.m. to 7 p.m., seven days a week, until further notice. BP claims categories. Call 1-800-440-0858 to help expedite the process. If you are not satisfied with BP’s resolution, call 1-800-280-7118. The BP community outreach office is located at 435 East Government Street for questions on volunteering, vessels of opportunity program, or any other questions. Phone: 850-912-8640. To register as a consultant, contractor, vendor or submit information on alternative response technology, services products or suggestions, call BP at 281-366-5511. BP Vessels of Opportunity – see the master vessel charter agreement and vessel requirements checklist online www.deepwaterhorizonresponse.com. To pick up or deliver completed Vessels of Opportunity packets, visit 435 East Government Street. For information, call 281-366-5511. The Fish and Wildlife Service is working with Tri-State Bird Rescue & Research, contracted by BP to provide assistance to oiled wildlife. Specific safety and other requirements must be met before anyone will be allowed on-site for any participation. If you have wildlife training, call 1-866-557-1401. Boaters are requested to report sightings of broken, disconnected or adrift boom and are asked to keep their distance from boom especially at night or in conditions of restricted visibility. Please report damaged, vandalized, adrift or stolen boom to: 1-866-448-5816. See details. Latest information from NOAA Fisheries Service, including federal fisheries closure, regulation changes and quota increases: http://sero.nmfs.noaa.gov. The Gulf Oil Spill Economic Recovery Task Force will meet on Wednesday, June 30 from 9 a.m. to 4:30 p.m. at the University of West Florida Conference Center, 11000 University Parkway, Building 22. The meeting will also be web cast. Web cast and further information can be found at www.flgov.com/gulfrecoverytaskforce. Five skimmers were contracted by the state of Florida for this area with one skimmer designated for Escambia County. See Florida Department of Health information and alerts about the health effects from oil. See DEP’s Homeowner Tips for Protecting Florida’s Shorelines (PDF). The Small Business Administration issued an economic injury Disaster Loan Declaration for the state of Florida. Pensacola office: 401 E. Chase Street, Suite 100. For more information on Economic Injury Disaster Loans visit the SBA website. For information on the Florida Small Business Development Center’s Mobile Area Command units, visit www.floridasbdc.org/Special Programs/bcrm.asp. Additional guidance to help small businesses survive a disaster can be found at www.MyFloridaCFO.com or by calling 850-413-3089 or toll-free 1-877-MY-FL-CFO (1-877-693-5236). Submit innovative technology ideas, suggestions or products by completing this form. Send the form and supporting documentation to Innovative.Technology@dep.state.fl.us. Video and audio public service announcements are available for download to educate the public on response, safety, coast watch and beach cleanup. See details. Report boom vandalism to the 1-800-320-0519 or #DEP from your cell phone. Buck Lee, Santa Rosa Island Authority Executive Director, will hold a news conference at 10 a.m. on Wednesday, June 30 at the base of the Pensacola Beach fishing pier. The topics will include water sampling testing and the safety of swimming in the waters. Keith Wilkins, Escambia County Community & Environment Deputy Bureau Chief, will also be attending. The Escambia County Emergency Operations Center is changing the operational schedule to Monday through Friday, 8 a.m. to 5 p.m.
A news conference will be held at 9:30 a.m. on operational days. In observance of the Fourth of July holiday weekend, the EOC will be closed on Monday, July 5. Normal operations will resume, Tuesday, July 6. News releases and updates will be sent as needed on non-operational days. County personnel continue to monitor the situation and will re-evaluate operations in the event circumstances change. Cleaning stations have been placed on both Perdido Key and Pensacola Beach at the crossovers (between the crossovers and the roadways) to aid in the removal of tar and oil. Clean-up crews continue to work both beaches at night when temperatures are cooler. “Hot shot” teams are responding to specific requests during the day as needed. Staff continue to monitor clean-up efforts and skimming operations. Skimmer vessels continue to respond as reports are received. Skimmers are working nightly. A federal website is live providing real time information about the Deepwater Horizon BP Oil spill into one customizable, interactive map. A Recreational Vessel Decontamination Facility for local boaters is being established. Reports vary widely throughout the day as heat from the sun brings subsurface oil to the top, and cooler temperatures at night tend to cause it to sink below the surface. Anyone caught destroying, disturbing or stealing boom will be prosecuted. If you spot any illegal activity related to the booms, please call 1-800-320-0519. See Escambia Inland Waterways Deployed Boom List. Boaters are asked to be mindful of the boom and skimming operations, to use slow speeds so as not to produce a wake that may disrupt the boom, and to be aware of restricted areas. A flashing light has been attached to all boom to increase visibility to boaters. The Intracoastal Waterway remains open. The Florida Fish and Wildlife Conservation Commission (FWC), in coordination with Florida’s Department of Environmental Protection, the Department of Agriculture and Consumer Services and the Department of Health, issued an executive order to temporarily close a portion of coastal state waters offshore of Escambia County to the harvest of saltwater fish, crabs and shrimp. Details. The closure includes state waters from the beaches out nine nautical miles into the Gulf from the Alabama line east to the Pensacola Beach water tower. Interior bays and estuaries remain open to fishing. This area covers approximately 23 miles of Florida’s coastline in Escambia County. Map. Recreational catch-and-release fishing is still allowed. The Pensacola Beach Fishing Pier and the Pensacola Bay Fishing Bridge are open for sightseers and fishing, however fishing off the Pensacola Beach Fishing Pier is catch and release only. Reconnaissance flights and ATV beach patrols are being conducted daily, weather permitting, to monitor Florida’s shoreline for impact. Unified command continues to check, verify the condition and make repairs as needed to currently placed booms. If citizens see anything unusual on the beaches, Escambia County has opened field offices on Pensacola Beach and Perdido Key to assist in answering questions from the public and to also act as staging areas for the county monitoring teams. The Pensacola Beach field office is located at 5 Via Deluna, Suite 8; phone: 934-6500. Staff continue to monitor and maintain boom. See Booming Locations and Booming Maps. On inland waters (bays, bayous, estuaries, rivers), private property owners may install oil absorbent material, booms or fences on private property above the mean high waterline (MHWL) only. No material may be installed or sprayed below the MHWL. On gulf-front property, the use of silt fences, obstructions, hay bales, peat, surfactants or other material is not approved. DEP is the permitting agency for beaches and coastal systems. No obstructions to sea turtle nesting behavior is allowed. Boom has been added by city at the Escambia Bay entrance to Gaborone Swamp off Scenic Highway. As requested by the city, additional boom has been placed at the mouth of Bayou Texar by the county to provide additional protection. Boom has been added by city to protect aquatic vegetation just south of 17th Avenue boat ramp at Bayou Texar on west side. DEP has boomed Project Greenshores Phase II from Muscogee Wharf to Hawkshaw Lagoon. Boom has been added by the city across entrance to Pitt Slip Marina in the very near future, as warranted. Boom has been added by the city to entrance of new Maritime Park bulkhead mitigation site immediately west of Crab Trap restaurant. City is currently requesting/seeking approximately 1100′ of boom to secure and protect the rip-rap surrounding the Bruce Beach wetland mitigation site maintained by the Port of Pensacola. Boom has been added by city to protect shoreline of Sanders Beach-Corrine Jones community center and waterfront park facility immediately east of Bayou Chico. The Occupational Health and Safety Administration (OSHA) has determined volunteers cannot be used in any situation where they may come in contact with oiled shorelines or oiled wildlife. If you see a tar ball on the beach, DO NOT PICK IT UP. Report it to 1-877-389-8932. Florida Department of Health Deepwater Horizon Health Information FAQs. Do not attempt to rescue oiled or injured birds or wildlife as this may cause additional injuries. If oiled, injured or dead wildlife are found, call 1-866-557-1401. Provide location where the wildlife was sighted. Boats should keep a safe distance from the booms. Do not drive boats over booms. Do not drive boats through slicks or sheens. Gulf coast residents may detect an odor because of the oil spill. Some are more sensitive to these odors and may experience nasal irritation and feelings of nausea. In combination with seasonal allergies or pre-existing respiratory conditions, some may experience more severe symptoms. For Air Quality Reports, see http://www.epa.gov/bpspill/air.html. Individuals who have pre-existing medical conditions, such as asthma or other respiratory illness should contact their health care provider if feeling symptomatic. If you see or smell oil, leave immediately. Avoid skin contact with oil or oil-contaminated water. Do not swim or ski in areas affected by oil, and if you travel through the area by boat, take care when hoisting the anchor. Restrict pets from entering oil-contaminated areas. If you get oil on your skin, wash it off with soap and water. Young children, pregnant women, people with compromised immune systems, and individuals with underlying respiratory conditions should avoid the area. Do not fish in the oil spill-affected waters. Do not harvest and eat dead fish, fish with oily residue or fish that have a petroleum odor. More information about what types of damages are eligible for compensation under the Oil Pollution Act as well as guidance to seek compensation can be found at www.uscg.mil/npfc. Florida emergency management and economic development staff are gathering information from businesses impacted by the Deepwater Horizon oil spill. Please complete their survey and help shape Florida’s response to this event. The survey will be updated periodically. Take detailed records of cancelled reservations. When cancellations occur, ask the party if the cancellation is related the oil spill. Keep the person’s name and contact information, and the revenues lost as a result of the cancellation. Businesses negatively impacted due to the oil spill, are asked to keep detailed profit and loss records should a claim need to be presented. Calculate estimated losses for a six-week period and have records, receipts and documentation to support your claim. Compare business to a five-year average of revenues between May and June, which can offer insight as to the damages incurred. Make a detailed list of assets, including non-structural, and include supportive records. If your hotel or restaurant is within walking distance to the beach, the business’s assets could be damaged even though there is no physical damage to the structure. Please record this depreciation. Mrs. Florence Merriline Garrett, age 86, passed away Monday, June 28, 2010 at a Pensacola, Fla. hospital. She was a native of Castleberry, Ala., a former resident of Brewton, Ala., and a resident of Atmore, Ala. for the past 43 years. She served as chaplain for the VFW Post 7016 of Atmore, vice-president of the American Legion Auxiliary in Brewton, Ala., a member of the Women’s Gardens Clubs of Atmore and a member of the Lottie Baptist Church. She was preceded in death by her husband, Jack Dempsey Garrett; a son, Donald Jack Garrett; and her parents, Issac and Cora Anderson. Mrs. Garrett is survived by three sons, Jerry Wayne Garrett of Atmore, Robert Dempsey and Kay Garrett of Indianapolis, Ind., and Michael Riley Garrett of Pace, Fla.; one daughter, Deborah and Charles “Shag” Thornton of Booneville, Ala.; seven grandchildren; seventeen great-grandchildren; and two sisters, Mary and Tom Mullins of Pensacola and Emily and Melvin Johnson of Jay, Fla.
Funeral services will be held Thursday, July 1, 2010 at 4 p.m. at Petty-Eastside Chapel Funeral Home with the Rev. Chris Pruitt officiating. Burial will follow at Oak Hill Cemetery. The family will receive friends Wednesday, June 30, 2010 between 6 and 9 p.m.at Petty-Eastside Chapel Funeral Home.